CNG: The Coin Shop. SAXON, Kings of Mercia. Offa. 757-796 AD. AR Penny. Superb EF, toned. Extremely Rare. SAXON, Kings of Mercia. Offa. 757-796 AD. AR Penny (1.12 gm), light coinage. O/F, F/FA/RE/X, diademed portrait bust of Offa / Floriate cross, I B B A in angles. Blunt 65; North 301; Seaby 905. Superb EF, toned. Extremely Rare. $16,500. CNR XXVII, June 2002, lot 129. Found in North Yorkshire, 2000 (EMC 2000.0639). One of only three known with this obverse design. 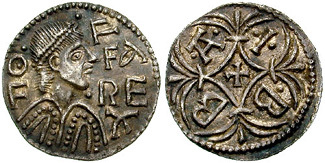 The reign of Offa is numismatically notable for a number of reasons. The most important of these is Offa's imitation of the Frankish denier. This created a model that was eventually adopted throughout England. The variety and beauty of his coinage far surpasses anything being produced in contemporary continental Europe. The portraiture of Offa's reign is highly accomplished, being quite realistic for the time. Perhaps no English king until Henry VIII surpassed or equalled his portraiture in terms of realism. Offa also struck in gold, as demonstrated by the famous OFFA REX 'dinar'.